Se avete bisogno di contattori elettrici con 3 poli, bobine di bobina 230Vac, dotate di alta capacità per usi elettrici generali, motori, impianti di illuminazione o di ventilazione, tra gli altri usi, è nel posto giusto. In questa sezione troverete un'ampia gamma di contattori trifase con una capacità di corrente compresa tra 9A e 95A. 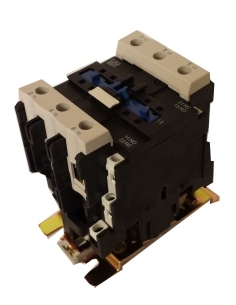 Electric three-phase contactor equipped with high-capacity contacts, with 85% silver, for control of electric motors, heating, lighting, ventilation, or general purpose, with 3 poles with a current capacity of 9A category AC3 or 25A category AC1, with 220-230Vac coil, closed auxiliary contact (NC). 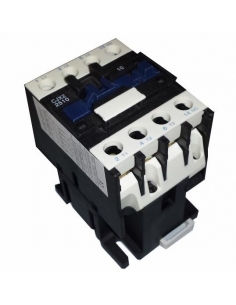 Electric three-phase contactor equipped with high-capacity contacts, with 85% silver, for control of electric motors, heating, lighting, ventilation, or general purpose, with 3 poles with a current capacity of 50A category AC3 or 80A category AC1, with coil 220-230Vac, the contactor is equipped with 2 auxiliary contacts, one open (NO) and one closed (NC). 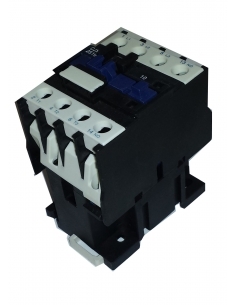 Electric three-phase contactor equipped with high-capacity contacts, with 85% silver, for control of electric motors, heating, lighting, ventilation, or general purpose, with 3 poles with a current capacity of 65A category AC3 or 80A category AC1, with coil 220-230Vac, the contactor is equipped with 2 auxiliary contacts, one open (NO) and one closed (NC).